Presidential aspirants on the platform of the Peoples Democratic Party (PDP) will commit to an undertaking not to defect to another party after the primary election. Besides, the party leadership assured the aspirants of free, fair and credible primary come October 6 in Abuja. Former Vice-President Atiku Abubakar, one of the leading contenders for the party’s ticket, said in Minna Thursday that all the aspirants agreed to sign the undertaking. Atiku said the decision was taken in Abuja on Wednesday night when all the aspirants met with the National Working Committee (NWC) of the party. The former VP spoke while answering questions from newsmen after addressing potential delegates and other stakeholders of the party at its secretariat. According to him, the undertaking will entail aspirants pledging to support the candidate of the party for the 2019 presidential election. Atiku said, “This is an issue that came up last night, we had our first meeting with members of the NWC. “It was agreed that before the conduct of the primaries, there will be more meetings. In one of the meetings, we will sign an undertaking to support whoever emerges as candidate. The former VP said he would readily abide by whatever agreement reached, but expressed confidence that he would emerge the candidate of the PDP for next year's election. “I have participated in a number of presidential primaries, at the end of the primaries I have always committed myself to supporting whoever that emerged, I don't think it is going to be a different case this time around,” he said. Atiku said his ambition to become Nigeria's president had never been a do-or-die. In a bid to have a rancour-free presidential primary, The Wednesday meeting was called by national leadership of party as one of the steps to ensuring a rancour-free presidential primaries. 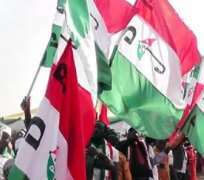 The PDP team was led by its National Chairman, Prince Uche Secondus. Other members of the party's National Working Committee and some members of the Board of Trustees were also in attendance. According to a report in The Punch, the President of the Senate, Dr Bukola Saraki; a former Vice-President, Atiku Abubakar; a former governor of Plateau State, Jona Jang; Sokoto State Governor, Aminu Tambuwal, a former governor of Sokoto State, Attahiru Bafarawa and a former Chairman of the PDP Caretaker Committee, Ahmed Makarfi were in attendance. Also in attendance were a former governor of Kano State, Rabiu Kwankwaso and a former Minister of Special Duties and Inter Governmental Relations, Alhaji Kabir Tanimu Turaki (SAN). Absent from the meeting were Ahmed Datti, Gombe State Governor, Ibrahim Dankwanbo and a former governor of Jigawa State, Alhaji Sule Lamido. The meeting was held behind closed door. It was gathered that Secondus told the aspirants that the party would conduct a free, fair and credible primary. He was also said to have assured them that the NWC had no favourable aspirants among them, adding that the primary aim of the party was to sack the All Progressives Congress' Federal Government in 2019. He told them that the party and others leaders in the country would want the aspirants to cooperate with whoever emerged as the party's candidate at the October 6 national convention. A source at the meeting said, “Secondus, in his opening remark, thanked the aspirants for having confidence in the party and its national leadership. Sources at the meeting told our correspondent that the aspirants demanded a free and transparent primary. According to The Punch report, Secondus said he assured the aspirants of the party at all levels that there would be free, fair and transparent primaries where the delegates' decision would prevail. “Let me tell you that we the members of the NWC are assuring all aspirants of our party that the era of impunity or imposition is over in the party as a rebranded PDP under my watch would ensure transparency and fairness for all,” he added. He said, “I told them that we must not forget to put the will of God in all we do bearing in mind that nobody gets power unless as designed and approved by God. It was also gathered that all the aspirants in attendance were given time to speak.